Libellula was founded in 2013, stemming from the collaboration of three friends, all teachers of Italian as a foreign language and each specialized in teaching a different language. After working together in other schools, we've developed this project in order to put our ideas into practice and thus spread our love for languages. Besides evoking the idea of elegance, the name Libellula (Dragonfly) includes our initials - ELeonora, LUna and LAura -, and that's the reason we have chosen it. 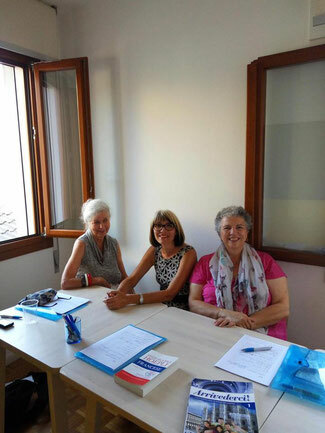 We offer Italian language courses with different options, but we also offer language classes for more than a dozen languages, in groups and individually, in person or via Skype. Furthermore, we offer English labs and summer camps for Italian children aged 4-14 and language learning events such as original language movie screenings, study trips abroad, happy hour conversation at the pub and music nights. My name is Eleonora. After graduating in Foreign Languages at the University of Venice, I mastered in German and teaching Italian as a second language. I've been teaching languages for several years to all those people who approach this wonderful world. I'm passionate about music, Japan, travels and anything that allows me to get to know other people. my name is Luna and I have a degree in Foreign Languages with M.A. 's in English and teaching Italian as a second language. I taught both English and Italian to students of every age in Italy, Canada, UK and USA. After living abroad for two years, I'm back to Italy, ready to help as many people as possible to learn new languages! My passions are rock music, travels and writing short stories. I'm Laura and I love teaching. I graduated in English and mastered in Spanish, my true passion. My education also includes teaching Italian as a second language, my longtime profession. I'm a dynamic person who loves travelling, dancing, reading and the Italian and international cuisine. I'm also interested in anything related to Spain, especially after living in Sevilla for one year during my Erasmus experience.